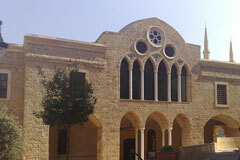 St George church is the seat of the Greek Orthodox Metropolitan bishop of the Orthodox Archdiocese of Beirut and one of the oldest churches in Lebanon. 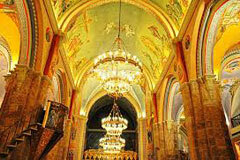 According to Papapostolou, in his article: "Greek Orthodox Cathedral of Saint George: The Oldest Church in the City of Beirut" the Anastasis cathedral was the first church to be built on the site of the Saint George cathedral. It was built by Efstathuis in the fifth century AD and bordered the auditoria of Beirut's Roman law school. The massive earthquake of 551 AD destroyed the Anastasis cathedral and in the 12th century a cathedral was built in the same location who was badly damaged by a 1759 earthquake and was pulled down to be built anew. In 1772 the church was rebuilt on a cruciform plan with three naves, a new portico was added to the north facade, the main western facade was enlarged and a new bell-tower was built on the north-western corner. The excavations in 1994-1995 undertaken under the cathedral covered 316 square meters and revealed many archaeological layers that allowed a historical timeline of the church: works unveiled a number of artifacts and vestiges spanning the Hellenistic, Roman, Byzantine, Medieval and Ottoman eras. The aim of the excavation was to locate the Byzantine Anastasis cathedral in relation to the standing cathedral and ultimately triangulate the location of the ancient Law School of Beirut. The museum consists of a crypt running under a part of the cathedral where visitors walk through 12 stops showcasing the different archaeological and historical layers: the display includes a number of finds such as oil lamps, smoking pipes, pottery, statuettes and Christian vessels and ornaments. Other vestiges kept in-situ include parts of the older churches' altars and apse, mosaics, stone engravings, tombstones and columns, some of which belong to the old city's Cardo maximus.